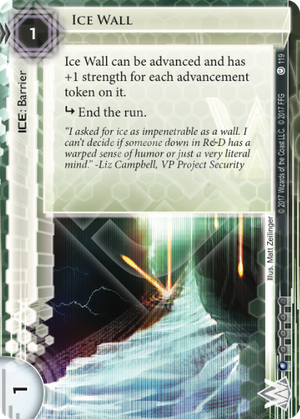 Ice Wall can be advanced and has +1 strength for each advancement token on it. You know what happens if you leave an Ice Wall on the board with Anson Rose piling up the tokens for a few turns? You get the Great Wall of Weyland. It's an annoyingly effective two-card combo, keeping a one-cred piece of ice relevant even way late into the game. Ice Wall is one of my favorite pieces of ice. It has a rare quality among ice, in that it can be just as valuable unrezzed as rezzed in the right deck. How? Play it in a space ice deck, drop 3 tokens on it, and all of a sudden it looks like a Wormhole, Nebula, or Asteroid Belt. I've even dropped 5 tokens on it, and fooled my opponent into thinking it was my Orion. All that stopping power on a piece of ice that pulls double-duty as an early turn gear check. Of course, being advanceable makes for some very interesting combos—such as with Builder, Constellation Protocol, Firmware Updates, or Satellite Grid—as well as counterplay. Runner has an Atman equal to your wall? Drop a token on it. They have a Net-Ready Eyes in play too? Just move a token away with Constellation Protocol next turn, or rez your Satellite Grid during the run. Additional tokens on IW often pay dividends over the course of a game, especially if your opponent is relying on Corroder. Or maybe you want to get your Orion up after IW is no longer cutting it. Move your tokens there with CP, then rez it either during a run or beforehand with Executive Boot Camp. When done, move the tokens back—and if playing Blue Sun: Powering the Future, return the Orion to your hand for a massive profit of 15. But the real shenanigans happen when this is combined with Builder or Hollywood Renovation. IW can get big—REALLY big. I've seen IWs at over 10 strength on rare occasions, teaching runners that while they can sneak through with their Corroder a couple times, Builder is the real problem, and it's out of reach of Yog.0 without a usable Datasucker or Net-Ready Eyes/The Personal Touch/Dinosaurus. You can also play Commercialization in these situations and laugh all the way to the bank. The final trick I love to pull with IW is to move tokens from it to agendas or ambush assets via Trick of Light. This puts a lot of agendas in range of fast advance, while putting your initial tokens on difficult to trash ice. A Spooning Rielle or Knifed are about the only ways to reliably shut it down. Lastly, I'd love to compare to its closest big brother, Fire Wall. Many people ask, "Why play IW over FW, when it takes a lot more s to get IW up to FW's strength?" Well, there are a few things wrong with this logic. First, it assumes you are advancing IW by clicking for it, which is only one of many ways to get its strength up. Builder will often get it up to at least 3 strength, Matrix Analyzer can save you the , and Space Camp can even drop tokens on it in a pinch. Second, and often more important, is it's rez cost is only 1. If you have 6, and get Account Siphoned, this can still be rezzed (while FW cannot), and can still be quite formidable with a few tokens on it. A staple piece of ICE for Weyland, and solid one at that! (Pun intended). A 1 ETR ICE that can't be instakilled by a Grimoireless Parasite is perfect for early game, and sporting a single influence for an added bonus of strength boosting is a rare treat. The 'advance to make stronger' ability rarely gets used, probably because no corp sees value in spending clicks on it. Jinteki users tend to splash Ice Wall, only as a conduit for Trick of Light, and Shipment from Kaguya always fits nicely with advanceable ICE on the table. Despite being one of the weakest ICE about, Ice Wall has great versatility with no inherent weakness, but is overshadowed by Eli 1.0. If money is a problem, consider this piece of ICE instead, as you can always make it stronger when you're back in the cash. A great little ICE from the core set what more can i say. Well its cheap to res with low Str and thats part of its power it makes the runner go get their breaker for a low price. It can also b advanced allowing use of other cards like Trick of Light & Commercialization with the bonus that the Ice will be harder to get through at the same time. Low Influence to take out of faction. Takes time & 's to get strong.